Winemakers over three generations, our activity is situated at Villedommange, an old Champenois locality whose origins go back to the 7th Century under the name of Villa Dominica: the farm belonging to a lord. This lord was none other than Louis 1, nicknamed the Pious or the Debonair, King of France from 814 to 840. 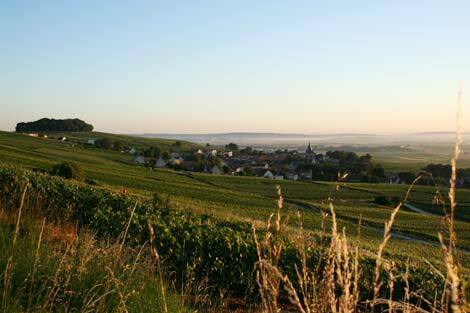 Villedommange is classified in 1er cru, nestling on the Montagne de Reims at 10 km south-west of the capital of Champagne. 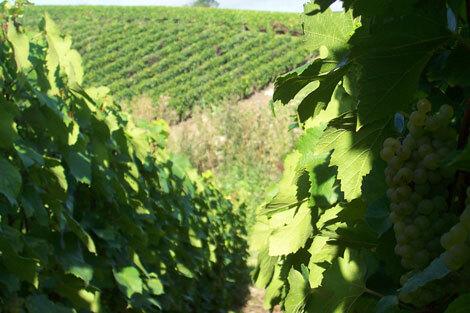 Pinot noir represents 22% and is a black grape, dominant on the Montagne de Reims. Its juice is white and gives full-bodied wine, well-structured and suitable for ageing. Pinot meunier at 42% is a black grape also with clear juice, for wines that are more supple, well-rounded and fruity. Chardonnay at 36% is a white grape. Its clear and sugar-rich juice brings finesse and elegance. Our Champagnes are aged with passion and only leave the cellars when they are fully matured, so you may fully appreciate the wines of our terroirs. Thus, with the minimum length of ageing at 15 months, we do not commercialise any champagne that is less than 36 months old for our rosé, 48 months for our Grande Réserve and 60 months for the 1er cru and La Favorite (blanc de blanc). 40% chardonnay, 30% pinot noir, 30% pinot meunier. The nose is very expressive, with great delicacy. It offers a lovely range, tending to anise aromas supported by the fruitiness of pear, praline and hazelnut. The ensemble is wrapped in lightly buttery notes. On the palate, freshness and suppleness are beautifully associated. Fresh yellow fruits characterise this cuvee where hazelnut and fresh almond also reign. Reserve wines from older vintages ensure a maturity that brings length on the finish. As an aperitif, of course, with white meats or again with a seafood platter, this is a cuvee that will revive in your memory at different moments. 35% Chardonnay, 27% pinot meunier, 25% pinot noir, 13% rouge AOC Champagne. Lovely pink hue with glints of raspberry. The nose is both ethereal and very fruity, evoking small red fruits and particularly rich, jammy strawberry. in the mouth it is bright and indulgent with great continuity of olfactory characteristics. It also offers aromas of mango and peach with real breadth. Throughout tasting, fruit and maturity are expressed in fine balance. This rosé is sublime as an aperitif, unique with red meat and surprising with red fruit based desserts. Lovely, limpid colour and sparkle. From its rich and complex bouquet, buttery and creamy notes are rapidly perceived. This wine acquires its maturity during its cellar ageing. The harmonious palate, with great freshness, expresses a certain complexity in its finesse. A silky, harmonious touch marks this lively, well-structured champagne. This cuvee, all finesse and elegance, is the ideal companion as an aperitif. You will match it with fish or white meat; your guests will be enthralled ! 50% chardonnay, 25% pinot noir, 25% pinot meunier. The nose is of great aromatic richness and bursting with freshness. It opens up progressively through floral notes to finish with a toasty touch. The first impression on the palate is in full continuity of its olfactory impressions: crisp pear and fresh mint delicately invade the palate. The second wave is based on the grilled, toasted aspect of this fully mature wine. The chardonnay presence lingers in a pleasant sensation where minerality and fruit combine in the long finish. This wine, of undisputed elegance and faultless quality will go marvellously well with new, traditional or regional cuisine. There are few constraints, just providing the pitfalls of bitterness and acidity are avoided, if these flavours are too strongly present in a dish.